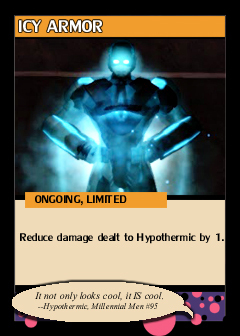 A mutant with the ability to subconsciously manipulate thermodynamics to create fields of intense cold, Hypothermic is surprisingly powerful but also somewhat fragile. 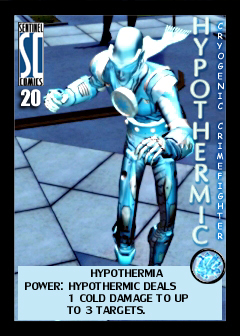 Hypothermic worked solo briefly under the code name Iceblue, but got in over his head and was almost killed or badly maimed fighting a gang of street thugs. 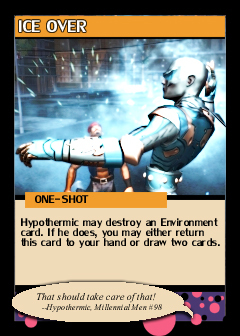 Luckily he was saved by Hype, the Hypersonic Man, another mutant crime fighter. 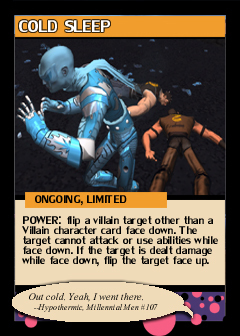 The two worked well together and teamed up on and off for many years; Hypothermic dropped the Iceblue name in favor of his current moniker to accentuate the heroic duo thing. At Hype's urging and sponsorship, Hypothermic joined the Millennial Men supergroup and quickly proved to be a mainstay for the team. Over the ensuing years Hypothermic has fought more supervillains than he can recall, helped fend off several alien invasions and two dimensional incursions, stood firm in the face of supernatural horrors from beyond, disrupted seemingly endless villainous schemes, and has done his part to save the world at least a dozen times...all while somehow managing to retain his rather corny sense of humor. 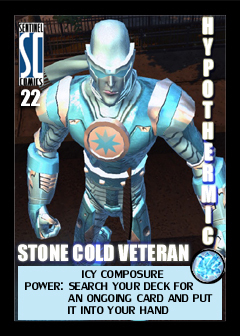 Despite his long experience, incredible power, and history of success, Hypothermic still enjoys patrolling the streets for everyday crime like a neophyte or low powered hero, and is famous for inviting old friends to go out and "patrol" with him to catch up on old times. 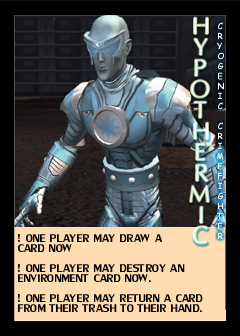 The surrealism of the likes of Hypothermic and his old bud Hype, or other world-class superheroes like Microwave, or Proto, or Tennebrae and so on taking down street thugs seems to be entirely lost on him. 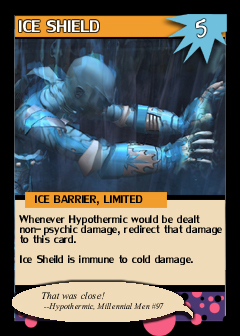 Though he can dish some damage, Hypothermic is primarily a team supporter, with the ability to interfere with and hamper the opposition, and to shield himself and his teammates from harm. 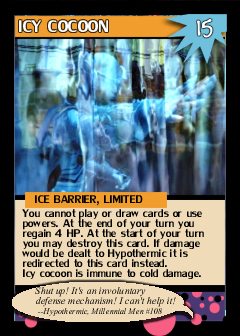 The core play experience for Hypothermic is centered on his Ice Barriers, which slightly more than 50% of the deck is built around. 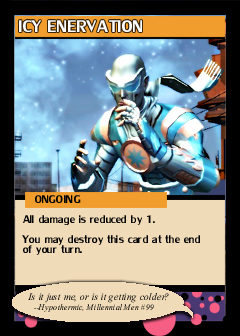 The remainder of the cards in the set mostly offers side-grades and limited upgrades, and due to their low copy counts wont show up in every game. 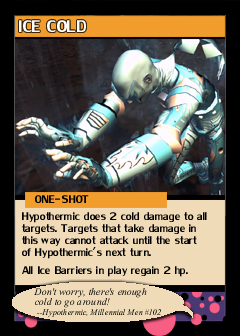 Thus, Hypothermic might feel a little erratic, but he's also very flexible and has a high replay value due to the variation in card combinations. 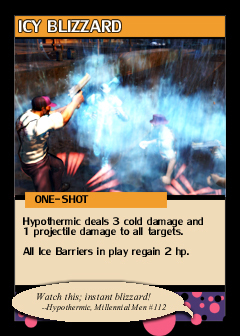 To be successful with Hypothermic requires using his Ice Barriers and enemy attack suppression abilities well. 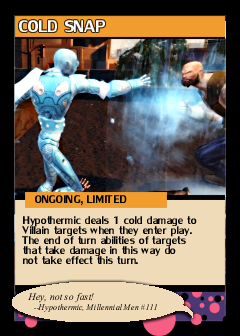 NOTE: Several of Hypothermic's cards redirect damage to themselves. 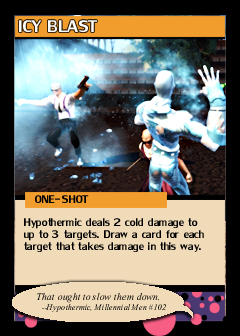 It is possible that Hypothermic is protected by more than one of them simultaneously; if this is the case you decide which of the available targets to redirect damage to on a case by case basis. 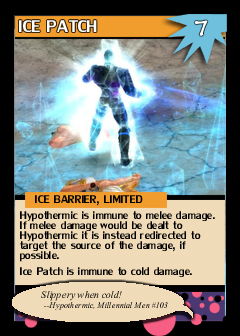 For instance, if Hypothermic has both an Ice Shield and an Ice Wall in play and would be dealt damage, you may choose to redirect the damage to either one. 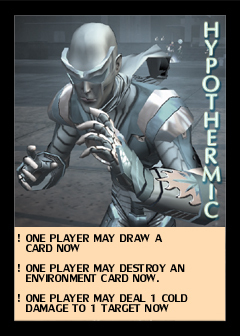 Art for the back of the hero deck cards (yes, it's mostly white). 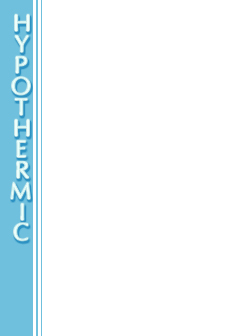 Alternate / promo version of Hypothermic. 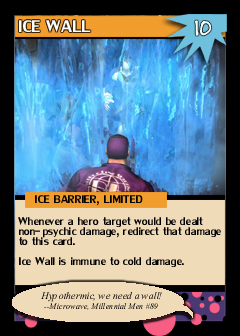 Note that this affects all targets; however if Ice Wall is in play damage to hero targets gets redirected to it, and Ice Wall is immune to cold damage. 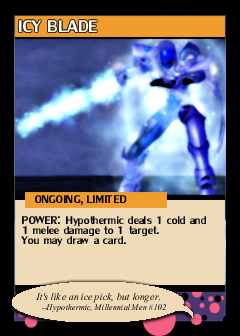 This is a panic card. 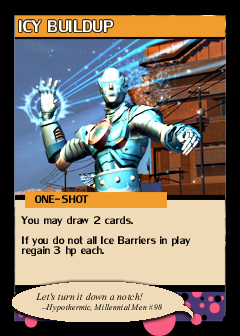 This card conceptually traps villains in ice. Also, notice that it doesn't restrict type of target; you could put this on an ally to save them, or on Hypothermic himself in a pinch. 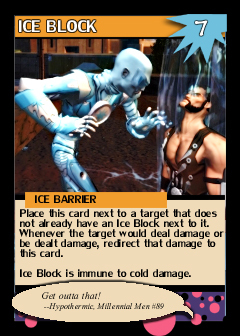 Other Ice Barriers are also targets, thus you can put an Ice Block on an Ice Shield or Ice Wall or even another Ice Block as 'ablative' hit points, conceptually just thickening up the ice barrier. The content is provided strictly for "fair use" fan enjoyment, and not as a challenge to the IP of Greater Than Games, LLC.